If you’re lucky, the masses don’t even need to know your name to know how much they like your music. Today’s featured artist is summed up in many circles simply by “BA-BA-BA!” Whether you’re at your favorite sports stadium, the local pub or at the grocery store, you hear his music regularly and can’t seem to help but sing along. Neil Leslie Diamond was born in Brooklyn, New York in January of 1941. His family lived in several homes in Brooklyn, but also spent a few years in Cheyenne, Wyoming where his father was stationed for the army. They grew up in poverty so extracurriculars weren’t necessarily a priority. It wasn’t until high school when Neil joined the freshman chorus and choral club, along with his classmate Barbra Streisand. They weren’t friends at the time, but got to know each other a bit. The Diamond family moved again, and Neil started at a different high school. At 16, he was given his first guitar and spent a summer at camp. Popular folk singer Pete Seeger performed at the camp, and Neil recalls seeing him perform, the other kids singing along and he knew he wanted that same thing. He immediately began writing songs and taking more official music lessons. In spite of also being a collegiate fencer at NYU, music was his primary focus. He would end up dropping out 10 credits short to take a job at Sunbeam Music Publishing writing songs for others. In spite of only making $50 a week, he felt he found his calling. After the writing job ended, he got his own recording contract as a musical duo with Jack Packer. That was also short lived and in 1962 he got a solo deal. After failing to chart, he was dropped and went back to writing. His biggest breaks came with the band the Monkees, including writing the famous track “I’m A Believer.” After a move to a new label, his solo career began taking off. With smash hit singles like “Sweet Caroline,” his popularity began to take off. Today, I’m listening to his 13th studio album You Don’t Bring Me Flowers released in November of 1978. At this stage, his popularity was to the moon. Diamond was selling out worldwide shows and was heralded for being the first male solo act to have the gumption to do so. Solo acts were reserved for only the most talented female artists at that time. The title track of this record appeared on his previous record, but this showed up as a duet with his old friend Streisand. They did a surprise live performance at the 1980 Grammy Awards to an ecstatic audience. Diamond has worked on other projects, namely soundtracks and other roles in film. His best-selling record is the soundtrack to a movie titled Jonathan Livingston Seagull which was panned at the box office, but the soundtrack received nothing but critical acclaim. When you look at his discography sales, you won’t find yourself overly impressed individually. He tops out at 7 million copies sold for one singular record. But when you add up his 32 studio albums, 9 live albums and dozens of compilations, he’s cracked the 100 million mark easily and is considered one of the best-selling musicians of all time. Just about one year ago, Neil decided to retire from live touring due to being diagnosed with Parkinson’s disease. He maintains his status as icon in pop culture—not only because of his music being played everywhere, but hit TV shows like Big Bang Theory referencing his career. 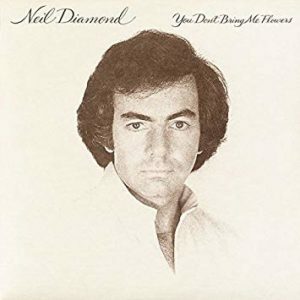 Neil Diamond is the type of folk pop that is hard to find intrusive, and you can simply kick the feet up on a summer day and sip a lemonade while listening. On the surface, it seems you could discredit the work as pop background noise, but his songwriting skills are second to none. So pick this one up today—it may almost be Valentine’s Day, but you don’t need to bring me flowers because you’ve got your troubles, I’ve got them too. Happy Tuesday!